Thank you for this great pattern. I crochet hats for a fundraiser our family holds every september for Breast Cancer research. I know that these will be popular. This is so cute. My husband has just started chemo & radiation for esophageal adenocarcinoma and there is a lovely young lady at 28 that takes chemo for breast cancer that has spread and from what her husband said it isn’t her first round there. I have secondary progressive MS and it is very hard for me to get around and even more so with all the stress from my husband she always makes sure I have a chair next to my husbands recliner and I wanted to do a little something for her. This is the hat I have been searching for. Your work is very lovely you are very very talented and I believe I will make some for the cancer patients there. I’m sure that young lady will be blessed with your gift. Prayers to all of you and healing for your husband and that young lady. Beautiful hats Kathy and as i was reading the pattern under Medium size you have a row 24 and then 26 but no 25!!!! Thought you’d like to know. Thanks for the patterns!!! Oops….Thanks Betty. I’ll remedy that today. Thanks for telling me. Thank you so much for this hat pattern. I love it. 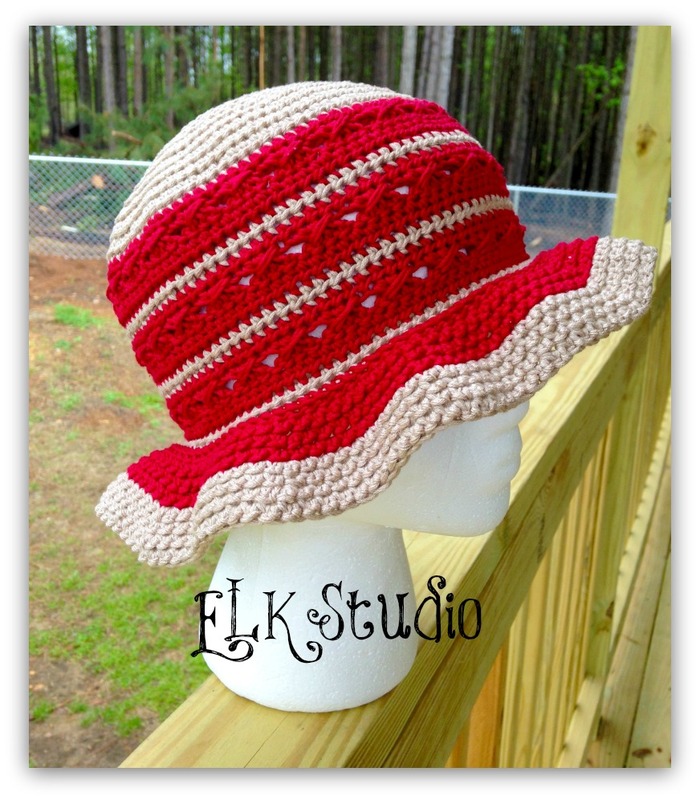 I make hats for the cancer center at MUSC in Charleston, SC. I am always looking for summer hats. I’m glad you found a hat pattern you liked. I’ll pray you regain all of your hair and receive total healing of your body. Blessings to you. Yes it should be 80. I’m sorry and thanks for bringing it to my attention. I will correct when I get home later this afternoon. Thanks! This pattern rocks. I can’t wait til it is done. I will send pictures. 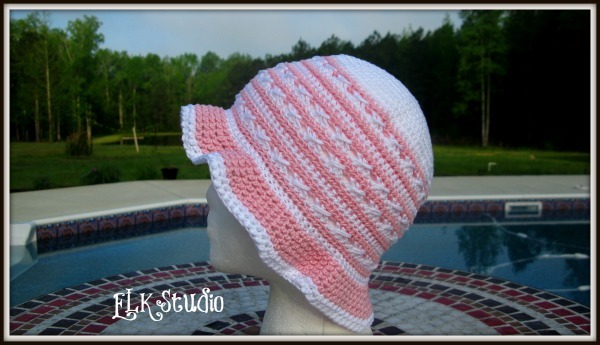 I made a pink and white hat and I absolutely loved this pattern! I plan to give the hat to a friend who has lost her hair. This will be a great weight for the summer months. 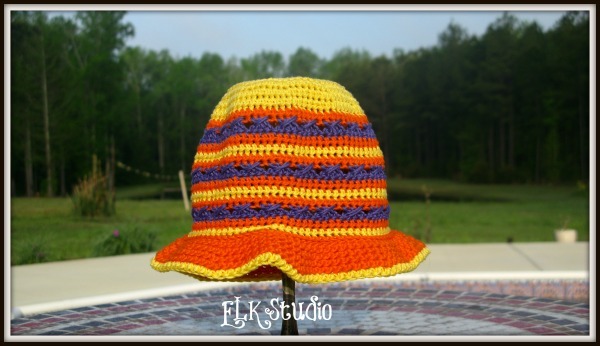 My hat is pictured on my Facebook page. Thanks for sharing this pattern! I’m so glad you loved the pattern. I know your friend will appreciate the hat!! I am having a difficult tome finding the special stitch instructions, can you direct me to where they are located on the page please? And thank you so much for the pattern. Your work is beautiful. I’m so sorry. Evidently when I updated the pattern this morning, I accidentally deleted the special stitch instructions. I’ve put them back in and they are located right under the Abbreviations Listing and right before the Adult Size hat instructions. Let me know if you need any other help. Thank you so much, I see it now and am relieved To find I have not totally lost it after all. Again you have been blessed with amazing talent and am glad you are sharing it. I made your hat, but I had to use the F hook, and I skipped about 8 rows on the hat, because it was huge!!! But it still came out really nice, thank you for the pattern. Glad to hear it turned out okay. Did you use Sinfonia? i used peaches and cream cotton yarn, 2 in ecru, 2 in sail away, where can I post a picture of it for you? That’s why your hat turned out big. That’s a #4 yarn and the Sinfonia is a #3 yarn. I’m coming out with directions for #4 yarn soon. You can send it to my Facebook page. Click on the icon on the homepage. I sent a friend request on facebook. I have never heard of the Sinfonia yarn, so that is why I tried it with peaches and cream 🙂 I can’t wait for the pattern using the cotton yarn!!! Sinfonia is cotton yarn too, just thinner. If you click on the icon on my homepage, it will take you to my business page. That’s where you can post the pic for me to share with everyone else!! Is the pattern out yet using other yarn? I love this pattern! I’m working on it now! Hopefully within the next couple of days!! Working on the special stitch and having trouble. After insert hook, YO, pull back through and two loops on hook, should I YO again before I pull through one loop and insert into same stitch? I have tried and tried, but if I do not do second YO only have 2 loops at the end. Yes, you will YO before you pull through one loop and insert into the same stitch. Pattern updated to reflect the YO in the pattern. Thanks! Round 15 also refers to dc on previous round, but round 14 is all hdc. You are helping me! I appreciate your critiques and notifying me of your problems. I want you to enjoy this pattern, and I can’t wait to see your version! 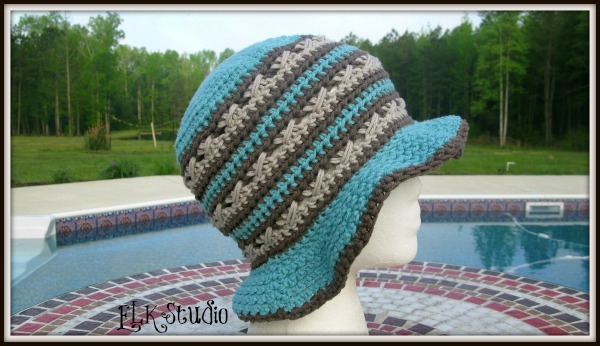 How wonderful that you will make some of these hats! I would love to see them when you’ve finished! Thank you so much for this hat. I live in Florida and a good friend just started chemo last week. This will be so perfect for her, especially in our sun and heat. Blessing to your for making her a hat, and I pray for a complete healing over her body. Thanks Carolynn. I pray your friends are blessed by your talent and heart. May they also get a total healing. Please enjoy the pattern. Is there an easy way to make this in smaller sizes for kids? I’m sure some little girls in a children’s hospital would love one of these! Round 8 gives you 5.25″ and you would skip 9 and 10 and go straight to 11 and follow the rest of the pattern accordingly. You may not need to do round 31 or 32 though as the brim may get too heavy. Round 9 gives you 6″ and you would skip round 10. The tricky part on this round is you need to have a total number of stitches divisible by 4, so you would need to decrease 2 stitches evenly on round 9 to give you a total of 88 stitches. On the brim, instead of increasing every 10 stitches, you would need to increase either every 8 stitches or 11 stitches. I hope this helps until I can officially get the other patterns written out. Thank you!!! Would this then fit a child age 3 to 10-ish? I think there is typo on round 12 (Round 12 ch 1 and hdc in same sp, hdc in next dc and around, join by sl st in first hdc. (100 st). It referenced a dc, should be hdc right? Thank you! You are right and it’s been corrected. Those dang typos can really throw things off at times can’t they?? ?